This a Bambu Gila performance, was taken in September 17th 2010, located in Morella village, the up-northern part of Ambon Island. It is traditionally presented along with other performances on the 7th days after Eid Day, e.g. Pukul Sapu, etc. Bambu Gila is literally translated as Crazy Bamboo. 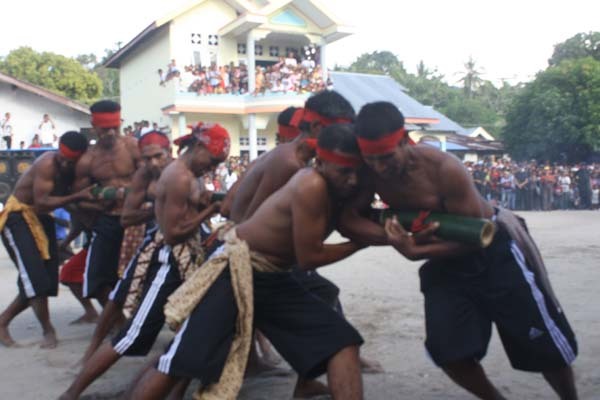 A very typically Malukan performance, also seen on Ambon but claimed to originate from Ternate. Here several people are holding a long piece of bamboo, which is then made to vehemently move around shaking itself after having some "magic" cast on it with some smoke. Supposedly it moves by itself, and so hard that it's difficult to hold, dragging the people around the arena with itself. Melanie Wilson, an Australian TV presenter for an Indonesian travel show called Belajar Indonesia had a chance to try it.